Our range of products include industrial filtration systems, industrial ro plant, automatic multi media filters and commercial reverse osmosis system. laundering, bathing, and dishwashing. A water softener is a whole house solution for hard water; it is not a water filter. The benefits of using a softener include keeping all fixtures from scaling or corrosion, using less detergents in the washing machine and keeping clothes soft and bright, eliminating steaks and spots on glassware and dishes, prolonging the life of the water heater and the refrigerator ice maker by preventing any calcium and magnesium carbonate deposits. A water softener can be used for the whole house or may be connected to the water heater only, thus saving in the operation cost. 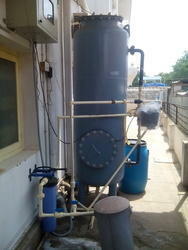 Being a quality oriented organization, we are engaged in offering Industrial RO Plant. This Industrial RO Plant is known for its efficient performance, high reliability and low operational cost. It is available in different standards and range. At pocket friendly price, customers can avail this product from us.